Xfce desktop session in Ubuntu 14.04 /14.10 does not display Network Manager, Messaging Menu, Keyboard Input, and Power icons on the panel out-of-the-box. Thanks to Mark Trompell, it’s quite easy to add those icons back to Xfce panel by a small plugin called xfce4-indicator-plugin. 1. 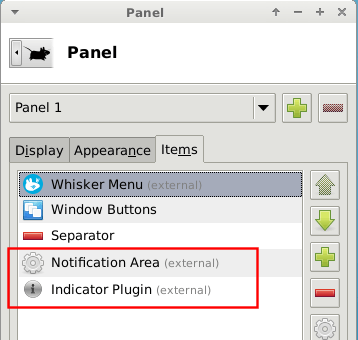 To install the plugin, open Ubuntu Software Center, search for and install the package xfce4-indicator-plugin. 2. Once you have the plugin installed, right-click on Xfce panel and navigate to “Panel -> Panel Preferences …. Under Items tab, add new item “Indicator Plugin” and put it right after the “Notification Area” plugin. While the plugin includes the time and session menu, you can remove the “Clock” and “Action Buttons” from the list. 3. 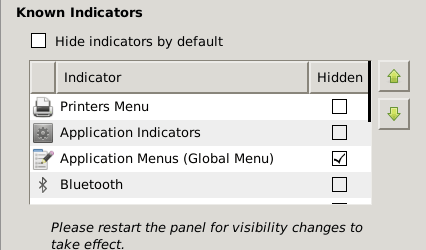 The xfce4-indicator-plugin includes the Global Menu indicator, which displays application menus on panel. If you don’t like this feature, right-click on the Network Manager icon and select Properties. When it opens, tick the box after “Application Menus (Global Menu)” to hide the applet. Log out and back in to apply the changes. Sorry that I removed your link because it’s unreachable and thanks for your info!